Each business whether it is a startup or large business needs a custom software to satisfy their particular business necessities. Each business has its own working conditions and capacities. With regards to independent venture, they should be increasingly versatile and need to change business methodologies according to advertise prerequisite. Custom software is the most recent pattern among private companies. It is getting to be well-known step by step and it has the ability to determine the exact business needs. Why there is a need for custom software development? In the ever running tech world and unbeatable competition in the industry, there is an urgent need to offer something unique and attractive to your customers. And do you think investing in a random software which seems good to you is a worthy idea? Might be not. 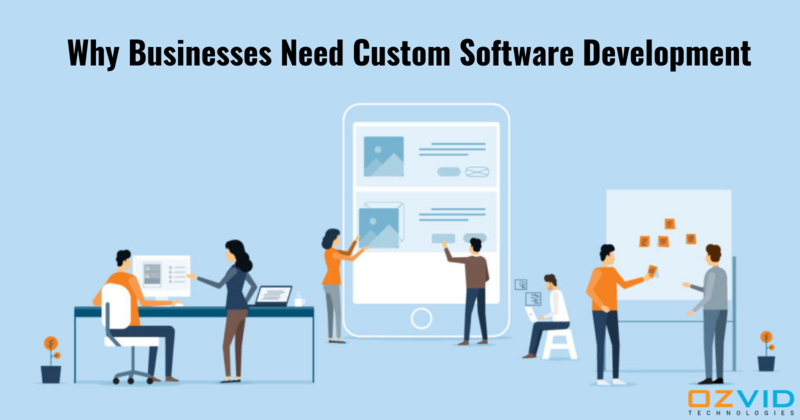 As the customers demand change and grow every moment, there is a need to go for a custom software which can satisfy the custom demands and deliver them what they are expecting from you. Using multiple software pieces to accomplish one task: Your company might be having one software for billing, another for shipping, and so on. But there is a better way to perform all these tasks in one go. You can simply have one software which performs all these tasks accurately. Tracking and analyzing data by hand: Maintaining data records through spreadsheets is a great idea. But if you are managing all the data of all operations via spreadsheets, it might be a tiring task. You need to get a custom software which can perform data analysis accurately while saving your time. Doing repetitive tasks manually: In every sector, there are certain tasks which are carried out on a regular basis. It could be the payrolls, inventory, or invoicing. There are chances that due to workload the staff commits mistakes and there are further financial losses to the organization. The software isn’t scalable: If you are using software to perform a particular task in your organization, it doesn't mean that it will remain suitable for the future itself. As your business requirements will grow, so will the software have to update. If your software isn't scalable, it's not beneficial for your organization. You have multiple locations: Large enterprises which have multiple locations, there is a need to keep updates about the recent activities on a regular basis. At this point, communication becomes difficult if done manually by the staff members. Your software is too old: It could be possible that the software you are using is out of date as per the present industry requirements. The software which you were using 2 years from now might not be fit for today's business requirements. How much does the custom software cost? When we hear the word 'custom' we simply think that it means expensive or something extra from the ordinary price list. Isn't it? But if one single software is capable enough to carry out the function of multiple other software, who would ignore such a software? Not only this, investing in custom software will reduce the burden over your staff and help in attaining more accurate and faster outputs. So, it's time to look up for a genuine software development company which can hear your business requirements and develop the right custom software for your organization. Want to know more about us or have any queries, get in touch with our experts and get the best assistance from us.